Our Charlotte, NC residential garage door service has something for homeowners on all kinds of budgets. Adding a new residential garage door adds value to a home and also enhances the entire neighborhood. Curb appeal is also greatly improved as this one simple change can usher in a whole new look. 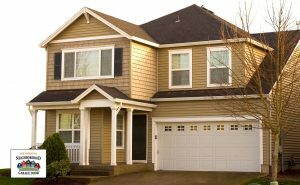 However, there are certain considerations to make when choosing a new residential garage door for your home. Price is among those considerations, which is why Neighborhood Garage Door “The Original” has a large selection of charlotte residential garage doors that fit into all different budgets. Another popular consideration is the actual look of the residential garage door. Some homeowners prefer garage doors that contain windows while others make it a priority to match the color scheme of the house. No matter what kind of look you have in mind, Neighborhood Garage Door “The Original” will take the time to find a residential garage door that matches your exact specification. There are also options to consider which can enhance both safety and convenience. Neighborhood Garage Door “The Original” provides installation services that include remote openers or keypads. The choice really is yours. A great deal of pride is on display every day at Neighborhood Garage Door “The Original”. That comes from being a locally operated and family-run business. Our goal has always been to take the selection, affordability and quality available at a national company and give it that extra special touch that only a family-owned business can provide. Shopping for residential garage doors in Charlotte, NC is now an easy, affordable and enjoyable process when you visit Neighborhood Garage Door “The Original”. Contact Our Offices Today To See How We Can Help Improve Your Home Or Business! At Neighborhood Garage Door “The Original”, we provide high-quality garage door repair, parts and services to residences and businesses in Charlotte, Matthews and South Charlotte, NC Areas. Also serving Fort Mill, SC. Please contact us today to request a quote for garage door installation, replacement, repair, or parts. Use our coupon(s) to save $100 on spring replacement or a garage door operator!